A little while ago a dear friend of mine called me in a panic. "You wouldn't believe what I just did!" she said anxiously. "You know how I hate the phone at work and it just calls people back when I accidentally hit the same button twice..." she said barely pausing for breath. "Well I was at work at the law office (where she works as a lawyer) and then a friend rang me on the other phone. We were having a good old session talking about well you know how I don't mind talking about my love life to my friends and I was discussing how I got myself into a compromising position with my husband when I realised that the other phone had redialed a client and left an entire long X rated message on a client's answering machine!" After laughing I offered up "Are you sure that the machine didn't just cut it off? Some of them do that after thirty seconds", trying to give her hope. "No, the client rang me back. They heard everything!" she cried out animatedly. Alas the client had heard every colourful word and my dear friend had to face this client in person. I commiserated with her trying to argue that at least it may have been the most colourful thing that the client all day or even all week and certainly much less boring than the usual stuff you hear about! Allow me to give you some colour another way Dear Readers today. 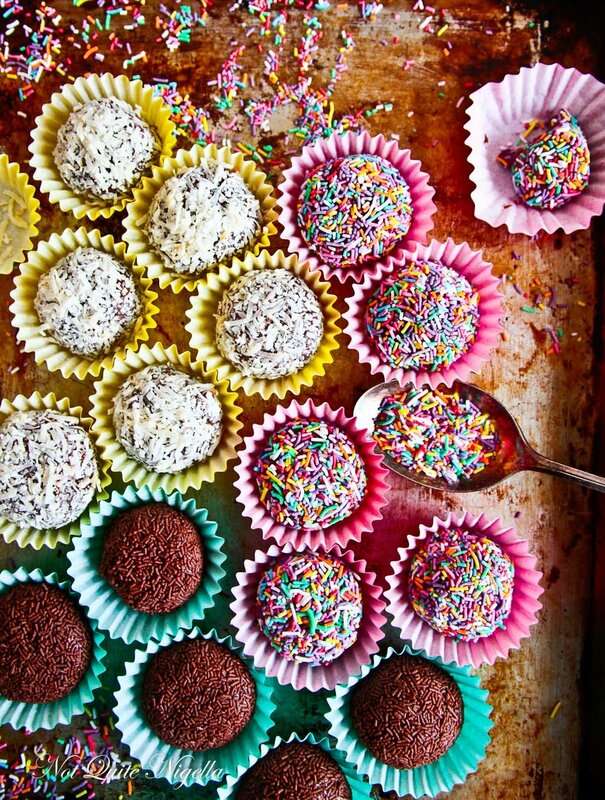 That is, with brigadeiros! 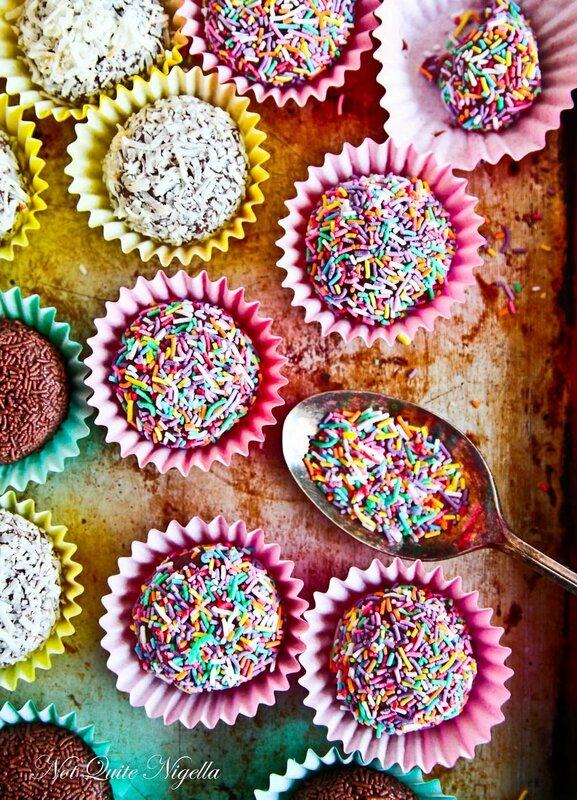 What are these little colourful bonbons you may ask? 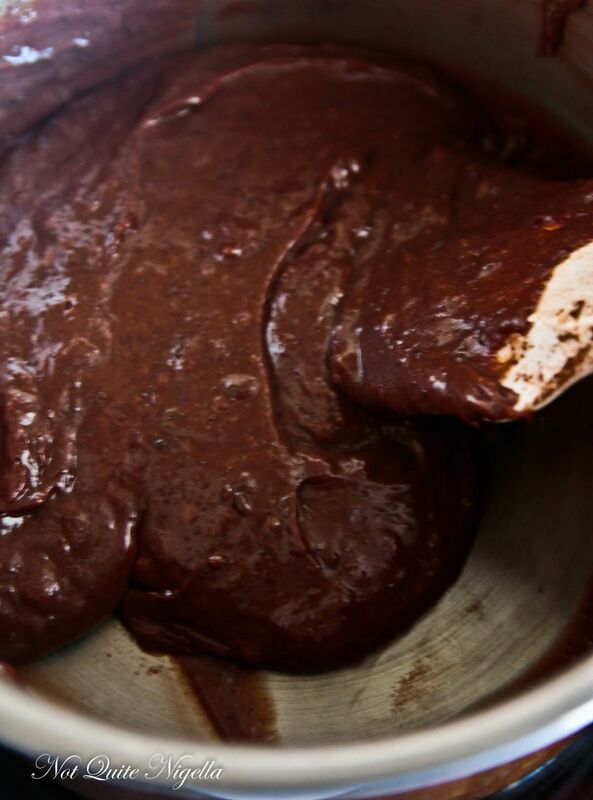 Well they're actually Brazilian chocolate caramels that are an absolute cinch to make. Named after the heroic Brazilian Air Force Brigadier and Presidential wannabe Eduardo Gomes who loved these sweet so, they turn up at practically every Brazilian celebration or birthday party. In 1945, when Gomes was running for President at election time women that supported him made these sweet little truffles at fundraisers. Gomes's catchphrase was "Vote no brigadeiro, que é bonito e é solteiro" which translates to "Vote for the brigadier, who's good-looking and single." I suppose he was emphasizing his strengths! So tell me Dear Reader, have you ever embarrassed yourself accidentally? And if you had accidentally received the message, would you have called back or pretended to not hear it at all? 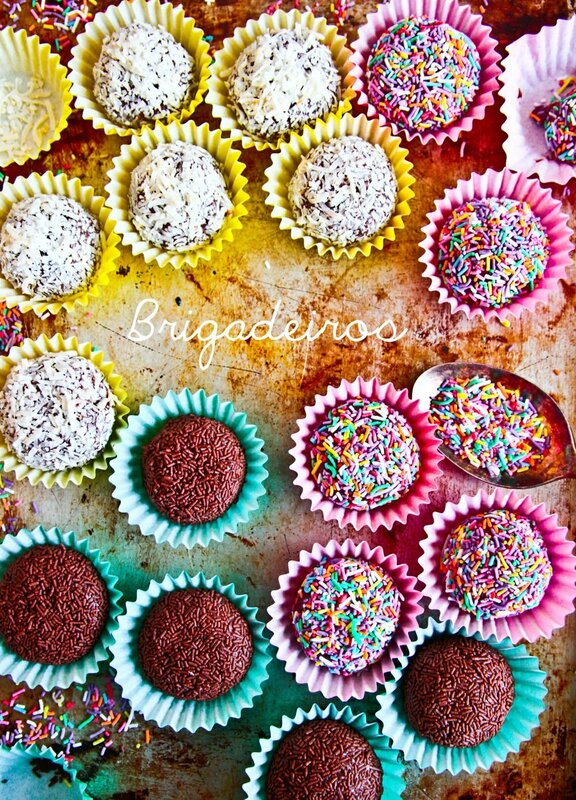 Have you ever tried brigadeiros? 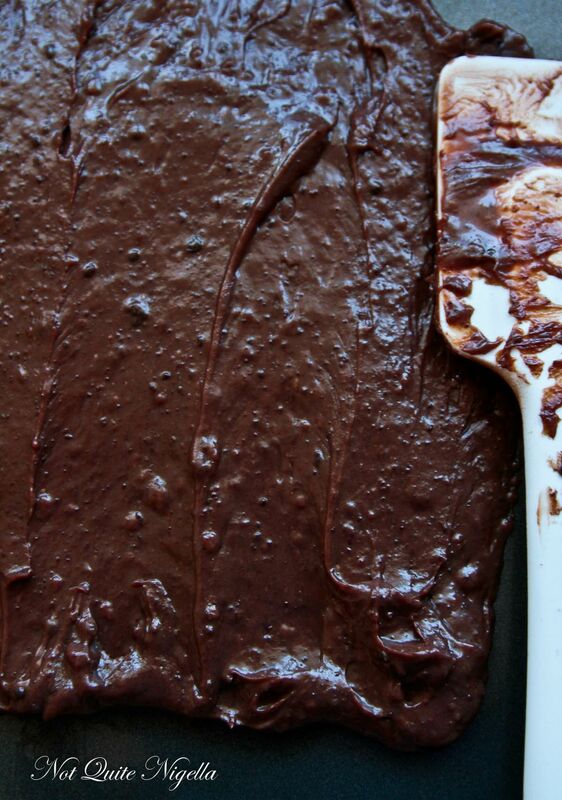 You can also coat in chopped, toasted nuts or any other sprinkles. Step 1 - Grease a baking tray with butter and set aside. 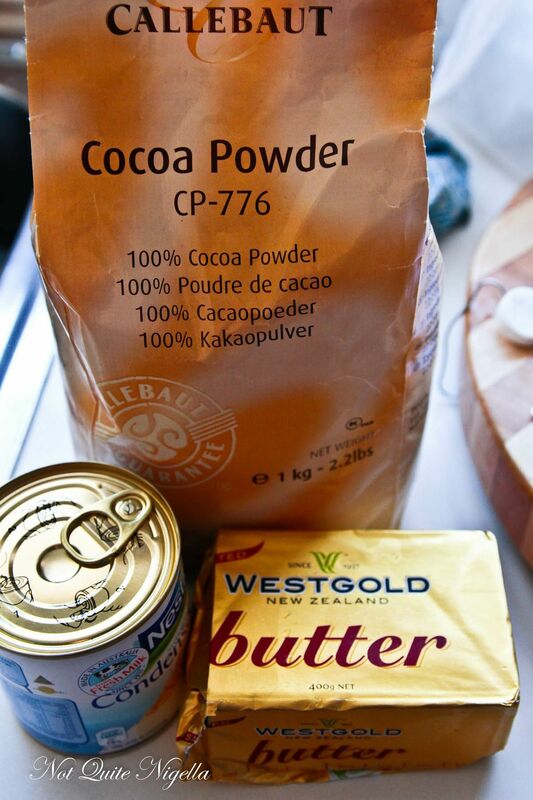 Place the milk, sifted cocoa powder, butter and salt in a pan on low to medium heat (I used setting 5 out of 10 on my stove) and allow the butter to melt and the whole mixture to thicken while stirring. It will go from runny to a thick, custard texture that holds its shape easily in about 10 minutes. I prefer to cook for this for a bit longer just to make sure that the balls hold their shape. Step 2 - Spread out onto the greased baking tray and allow to cool (about 10 minutes or you can place in the fridge or freezer to speed things up). 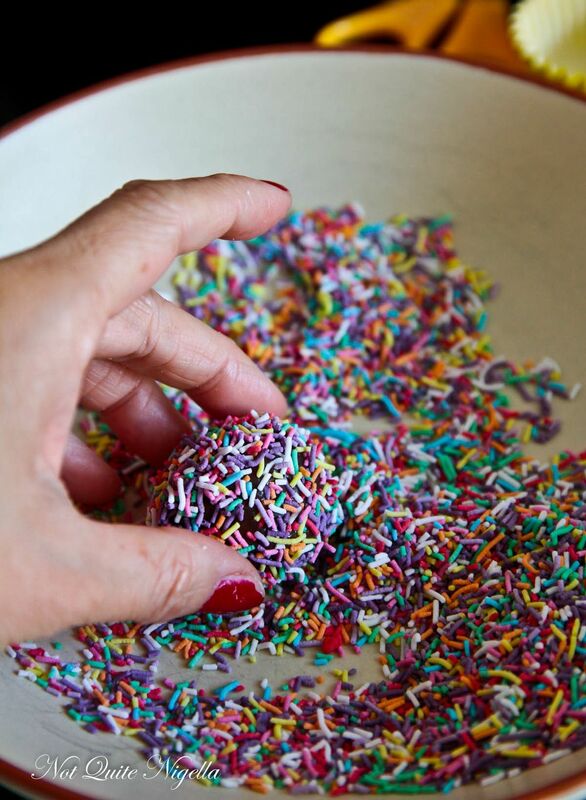 Place the sprinkles in separate bowls and have the little paper liners ready. Grease hands with the extra butter and pinch of a small ball's worth-about a teaspoon or even less will do and the mixture will be slightly stretchy and easy to work with (if not, cook again for 5 minutes on low to medium heat until it holds its shape in the pan). 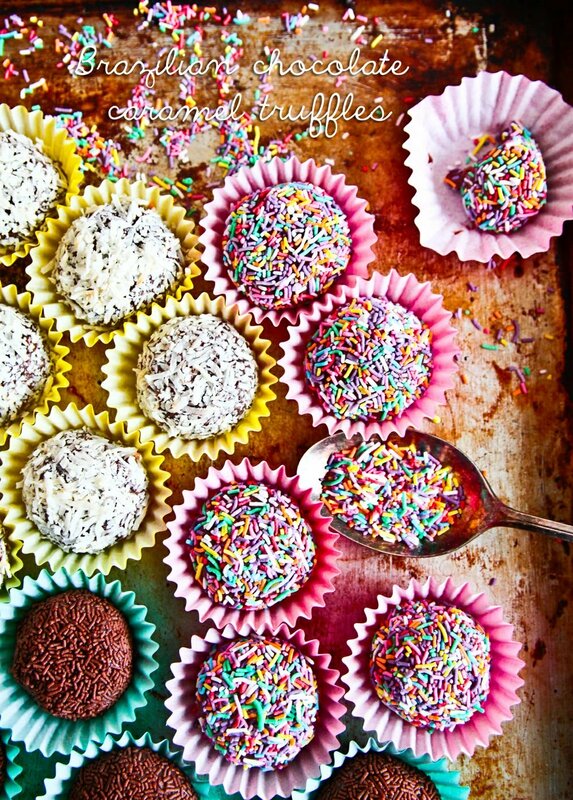 Roll the chocolate mix into balls and then dip into a bowl of sprinkles and shape further. Place in paper liners. Storage: these will keep for about 4 weeks in an airtight container at room temperature but they are sensitive to extreme heat.